These four destinations have trails that are worth taking a road trip to ride this fall. Plus, we have beer pairings to make it really worth it. Ask any seasoned mountain biker and they’ll tell you that riding in the fall is about as good as it gets. The weather is cooler, the leaves are turning and the trails are firm and fast. It’s the pedal-powered equivalent of a no-wind day on the links or surfing the perfect wave — recreation from another realm. Cap off your ride with a thirst-quenching craft brew (or two) and, well, now you’ve got a day for the ages. Hyperbole aside, you and your biking buddies could stay local when it comes to getting some autumn trail action, but with winter just around the bend, you might as well throw the bikes on the roof rack and get out of Dodge. Revelstoke, Fernie, Crowsnest Pass, Panorama; all offer world-class mountain biking within a half-day’s drive. Here are a few of the best spins (along with some recommended post-ride suds) to make the most of the season. Frisby Ridge trail, Revelstoke, B.C. 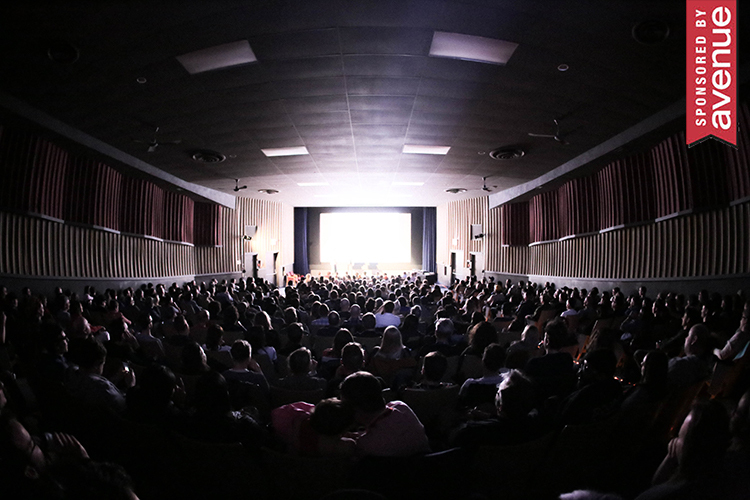 Photograph by Bruno Long, courtesy of Tourism Revelstoke. 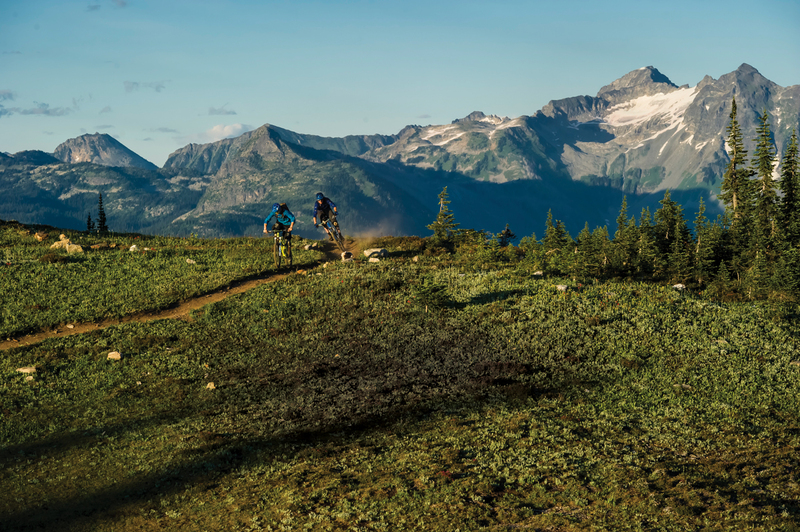 With more than 150 kilometres of single-track trail, including some of the best alpine riding in North America, we may as well call Revelstoke the “Moab of the Monashees.” Indeed, mountain-biking culture has infiltrated this fun-loving mountain town. 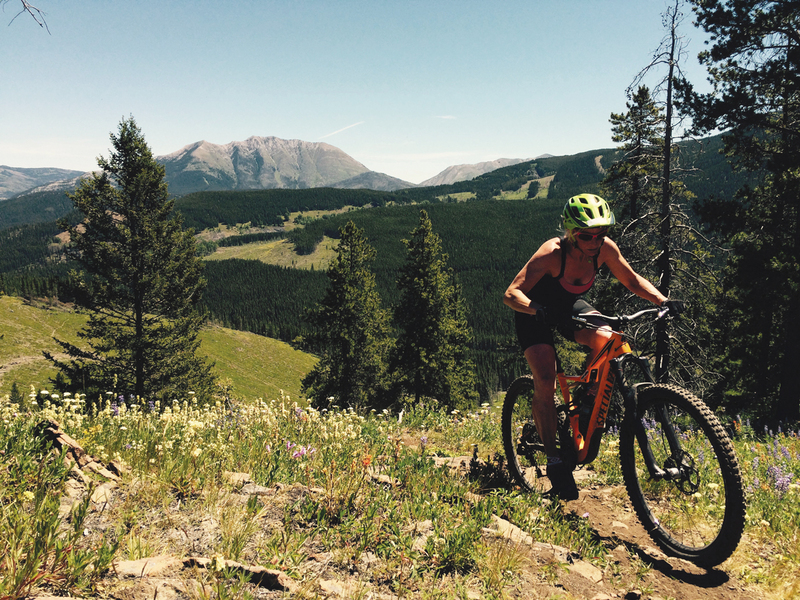 While the legendary Frisby Ridge trail is, by many accounts, the ace of spades in Revy, there are countless other options for a heart-pounding spin. Located on the west side of the mighty Columbia River, the Mt. MacPherson trails afford numerous loops, links and fast-and-flowy options. Flowdown, a classic downhill flow-trail (as you might have guessed from the name) is about as much fun as you can have on two wheels. If you love the rollers, jumps, dips and dives, this six-km out-and-back trail is a must-do. Voted Brewery of the Year at the Canadian Brewing Awards in 2017, Mt. Begbie Brewing is a wily veteran when it comes to British Columbia’s beautiful beer scene. While Begbie’s brand-new digs just east of town near the Coast Hillcrest Hotel are certainly worth checking out, you can also enjoy its delicious beers at numerous pubs and patios in town, including Craft Bierhaus and The Village Idiot. As for Begbie’s greatest gulp? If you ask most locals, that would be the High Country Kölsch, a 4.5-per cent German-style beer that’s infinitely crushable. Lazy Lizard trail, Fernie, B.C. Photograph by Mike McPhee. 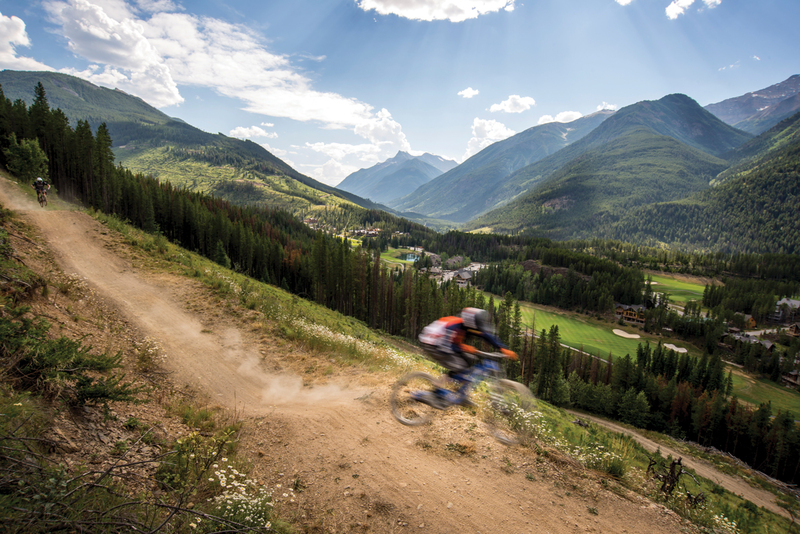 Fernie is a mountain biker’s dream (yes, it’s that good). There are more than 110 trails to ride — the vast majority of which are of the single-track persuasion — at seven different riding areas. If my math serves me correctly, that would lend itself to a week of riding in a different area each day. Numerous loops can be done right from town, making for ideal logistics for both the ride and the post-ride watering-hole session. 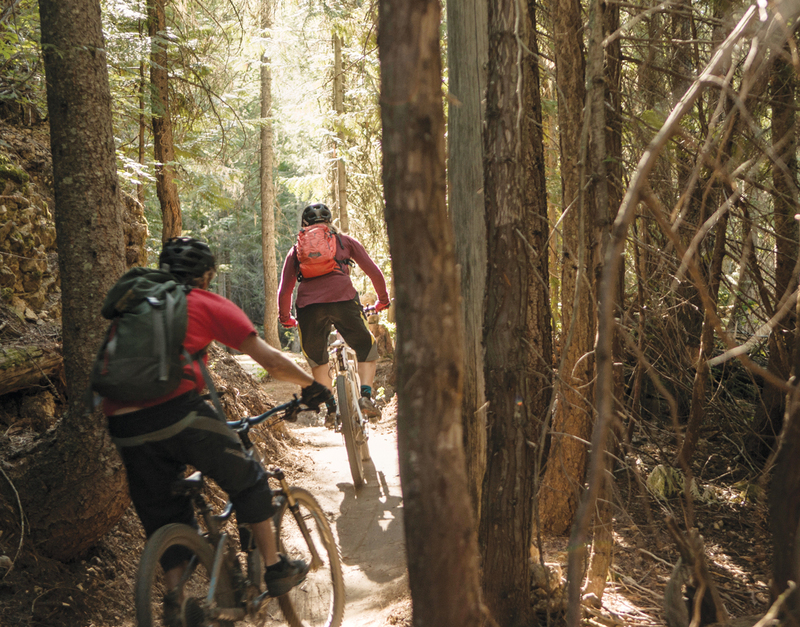 As difficult as it is to single out the perfect fall ride in Fernie, intermediate riders will not go wrong with a heart-pounding pedal down Lazy Lizard, a seven-km, machine-built trail that twists and turns through the old-growth forested area east of town. The trail incorporates plenty of bridges and berms and serves up views of Island Lake and the Three Bears peaks. Numerous scenic lookouts — not to mention the opportunity to have your highlight-reel lunch on the patio at Island Lake Lodge — make this one of the most memorable rides in the Rockies. Not surprisingly, Island Lake Lodge has plenty of chilled Fernie Brewing Co. bevvies to get you mentally prepared for the fast and flowy descent back to town. (And, yes, you should probably just have one.) Each and every pint of liquid courage from Fernie Brewing is oh-so-tasty, but the sentimental favourite has got to be the Project 9 Pilsner, named for a notoriously tough local trail. Big Bear trail at York Creek, Crowsnest Pass, Alta. Photograph by Christine Messenghers. Former World Cup downhill mountain-bike racer Karey Watanabe is the owner/operator of Sweet Riders, a mountain-bike instruction and tour company whose mission is to “spread the love of mountain biking in the Crowsnest, and beyond.” Watanabe calls the Pass area (which encompasses Blairmore, Coleman, Bellevue, Hillcrest and Frank) a “hidden gem” for mountain biking. One blast down Buck 50, a downhill flow trail built in 2016 at the local Pass Powderkeg ski area to commemorate Canada 150, will certainly open your eyes to the potent possibilities of this under-the-radar region’s trails. You can definitely make a day of riding at Pass Powderkeg, which has a network of 20 trails, but there are plenty of other places to explore, too. The York Creek area features 21 intermediate and advanced trails, and should be on every serious rider’s to-do list. The sweetest ride, if you’re not squeamish about steeps, is the difficult, highly-technical Big Bear trail, which serves up soaring views of the valley as it tumbles down rock slabs, gullies and tricky loose terrain. In other words, bring your A-game. You can’t go wrong with a beer and “The Burger” (when it’s this good, you don’t need a highfalutin’ name) at The Rum Runner in Coleman. However, if you want a local tap, dart over to nearby Lundbreck, belly up to the bar at the tiny, rough-around-the-edges Oldman River Brewing company and re-hash your adventure over a pint of Oldman River Pale Ale. Sweet caramel malt and stone fruit combined with a healthy dose of hops make this copper-coloured brew a thing of beauty. Mercy Me trail, Panorama Mountain Resort, B.C. Photograph courtesy of Panorama Mountain Resort. Panorama Mountain Resort is a pedalling paradise. For downhill daredevils, the lift-accessed bike park is definitely a top draw, offering dozens of fast lines with machine-built berms, banks and bridges. Director of mountain sports Jason Simpson and his talented team of trail builders have created some of the fastest, flowiest trails in bikedom. A rip down Let it Ride, Mercy Me or Rocking Horse will definitely make you feel alive. However, if you really want to live, do the ultimate Panorama pilgrimage — a rip along the Hopeful Trail at the summit. It takes a couple chair lift rides and a quick grunt up to the ridge to access one of the premier alpine trails in North America; the epitome of high-altitude cross-country cruising. All in all, the Hopeful Experience ($55 for two trips to the summit) yields 11.7 kms of riding and a mind-boggling 1,218 metres of vertical descent. It’s written in the cross-country constitution: if you complete two epic rides in one day you are entitled to at least two delicious, locally crafted beers on a sun-soaked patio to celebrate your accomplishment. The barkeep at the go-to pub in Panorama, the T-Bar & Grill, will be pleased to pour you a couple of Original 83 Honey Ales from Invermere’s Arrowhead Brewing Company, a dark-amber honey-brown ale made with honey from the brewery’s property. Yum. Or, if you prefer, you can bomb down the hill from Panorama to Invermere to Arrowhead’s taproom. There, you can try a pint of Loud Mouth Soup, a killer double IPA made with, in Arrowhead’s own words, “a sh$t ton of malt and a sh$t ton of hops.” Clearly, this is a beer that is not for the faint of heart. But, then again, neither is mountain biking. 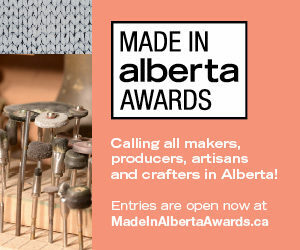 This article appears in the September 2018 issue of Avenue Calgary. Subscribe here.